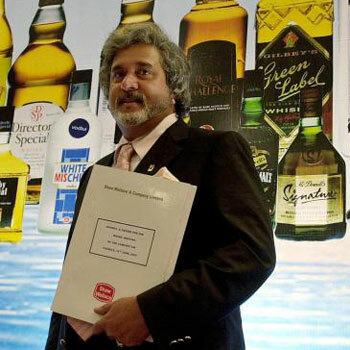 Could Diageo soon increase its stake in United Spirits, India’s largest spirits company in which it owns 55%? That intriguing prospect has been thrown up by the beleaguered former owner of USL, Vijay Mallya, as part of an enhanced offer to a consortium of India’s banks, who are pursuing Mallya and his associated companies, including United Breweries, for almost $1bn plus interest in loans made to his failed Kingfisher Airlines. Mallya, who has been convicted of bouncing Kingfisher cheques and is the subject of non-bailable arrest warrants in India, has increased his offer “in the interests of overall settlement” to about £720m from his initial £600m. As part of this latest offer put to the Supreme Court, Mallya’s representatives said that he could make an initial deposit by selling shares in USL that he controls via UB and Kingfisher Finvest. On Mallya’s figures they would be worth approximately £120m. Analysts believe that Diageo would be in poll position to buy those stakes to augment its overall control of USL. An open sale in the market might prove cumbersome and depress the share price, thus raising less than suggested. Equally, a small minority stake in a company controlled and run by Diageo might only be appealing to a handful of large investors, who probably would gain more by investing in Diageo itself. Were such a deal to be on offer, Diageo would no doubt consider it carefully. While it never comments on market speculation, the world’s biggest premium beverage alcohol group, would have no difficulty in funding such an acquisition; in the six months to the end of December it achieved free cash flow of £839m. It is widely agreed that USL is now on an upward trend under Diageo’s control. It is back in profit and is widely thought to be an excellent growth prospect now that it is pruning low margin brands and introducing more of Diageo’s premium lines to the huge Indian market. In addition, the prospect of severing the final links with Mallya, whom Diageo is paying £75m in return for his giving up the non-executive chairmanship of USL, would be a further incentive to look favourably at a deal. Meanwhile Mallya’s representatives argued in court yesterday that he should not be forced to make a public disclosure of his assets held outside India because despite formally being a member of the Senate, he is not domiciled in India. In addition, his three children are American citizens. He did, however, agree to draw up a list of all assets held by his family in India, which would be handed to the Supreme Court under sealed cover. The headline of this story has been changed after a previous version could have been interpreted to suggest that Diageo was in talks to buy more shares in USL. This has been corrected to make clear that Diageo is not in contact with Mallya and that any company could buy shares in USL, not just Diageo. We apologise for any confusion caused.